Lookin' might fine there, sackboy. Guess what was just released for LittleBigPlanet, LittleBigPlanet 2, LittleBigPlanet Karting and LittleBigPlanet PS Vita? Sony recently rolled out a pack of costumes from Mass Effect (ever heard of it? 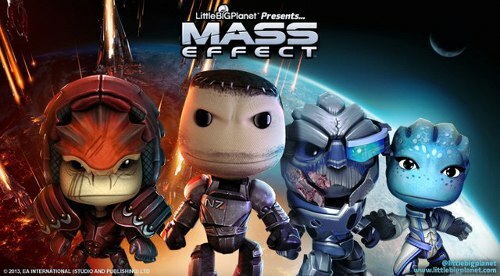 ), which includes skins for Shepard, Liara, Wrex, and Garrus along with a few in-game stickers. Just the sort of thing you needed to remind you that the LBP series still exists! Although this isn't a fashion blog, we'll still tell you that each costume includes a skin along with gloves, armor, and some sort of head/helmet. Garrus even has his eye piece, which looks, er, different on a short and puffy sackboy character. And although the DLC is technically for the original LittleBigPlanet game, it's compatible with the three other titles listed above. How about some LittleBigPlanet 3 news? Sorry, none of that yet, though it's still under development and hasn't been abandoned in favor of, I don't know, LittleBigPlanet Hopscotch. Page created in 0.3967 seconds.